OP3260. 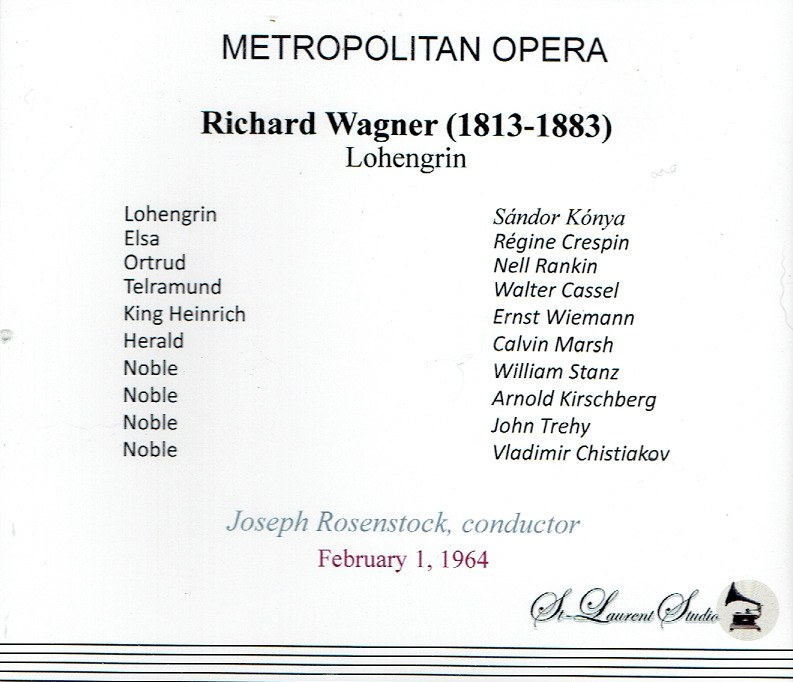 LOHENGRIN, Live Performance, 1 Feb., 1964, w.Rosenstock Cond. 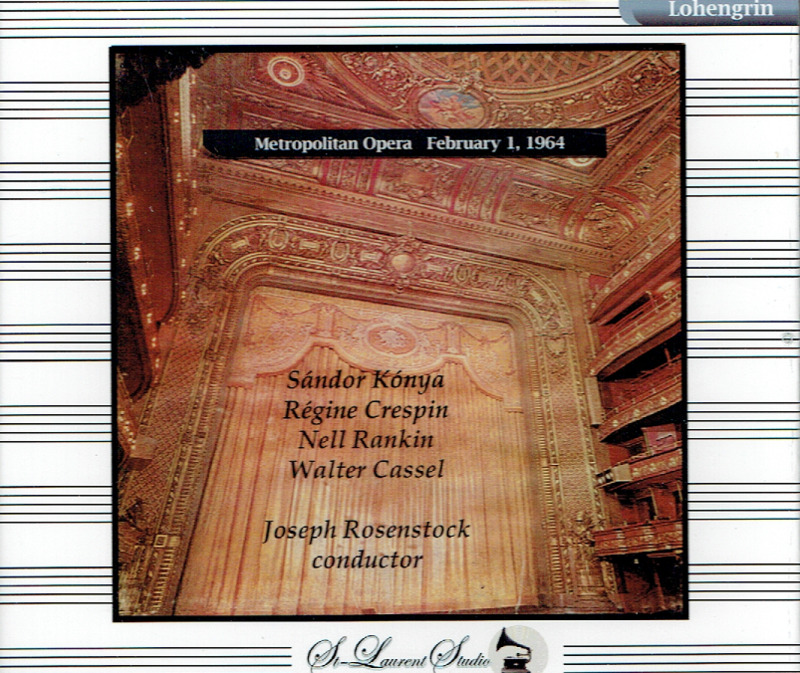 Met Opera Ensemble; Sandor Konya, Régine Crespin, Nell Rankin, Walter Cassel, etc. (Canada) 3-St Laurent Studio YSL T-662. Transfers by Yves St Laurent. "The noted Hungarian tenor Sandor Konya was surely the most successful Lohengrin of the 1950s and 60s, and I think a legitimate case can be made that he was the finest Lohengrin after Lauritz Melchior. Konya had a voice that combined power with a liquid tonal beauty, enabling him to sing with dramatic thrust and tenderness as the music required. He made a fine appearance in a studio recording of the opera in 1965 (RCA) with Erich Leinsdorf and the Boston Symphony, following a series of Tanglewood performances (three performances of one act per concert). Reports are that Leontyne Price was the planned Elsa, but for whatever reason she didn't make the performances and the rather unimaginative Lucine Amara turned in an acceptable but routine Elsa. The recording suffers from an overall lack of intensity, stemming from the podium (surprising, because I attended the live performances that preceded it, and they were very exciting). I am familiar with three live performances with Konya that have been preserved, two of which have been reviewed in FANFARE (interestingly, the RCA recording never was). Earliest is a 1958 Bayreuth performance, led by André Cluytens, with Leonie Rysanek's thrilling Elsa. It was reviewed enthusiastically by John Yohalem (Fanfare 5:2) and William Youngren (8:1). Perhaps even more enthusiasm was displayed by Youngren (6:5) and me (31:1) about a 1959 Bayreuth performance led by Lovro von Matacic with the lovely Elsa of Elisabeth Grummer. The tenor is wonderful in all performances, but this one from the Met in 1964 catches Konya at perhaps the finest point of his career. He had had enough experience with the role (he first sang it in 1953) to really inhabit the character and to drop some of the excessive sobbing he inserted earlier. At the same time his voice was still in its healthy prime. Because Konya possessed the ideal kind of voice for Lohengrin, he clearly relishes the role. I know of very few performances of 'In fernem Land' or 'Mein lieber Schwan', even on recital discs, that I prefer to what I hear in this performance. There is not a clear 'best' recording (longtime FANFARE readers know of my allergy to naming 'bests'), but this one is certainly on a par with the two Bayreuth performances. Matacic, a much under-valued conductor, may lead the most powerful and incisive of the three performances, but Cluytens and Rosenstock are not routiniers. The Met account also features an outstanding Elsa in Régine Crespin, whose opulent voice and easy high notes, particularly at this early stage in her career (she was 37 in 1964), allow her to soar through Wagner's long phrases with ease and glowing tone. The big act II duet between Elsa and Lohengrin where she can't resist asking his name is quite extraordinary, worthy of the term 'historic' despite it not being pre-war. Nell Rankin is very fine in the cruel role of Ortrud. Wagner makes it almost impossible to sing the part effectively without pouring out ugly sounds. I remember internally grimacing when Rita Gorr let loose in Ortrud's curse to the pagan gods. Some have criticized Rankin for not being forceful enough, which might be true, but the offsetting advantage is that she sings the role musically without resorting to shrill hollering. I'll take that tradeoff. Walter Cassell is a fine Telramund too, using his firmly focused baritone to effectively convey the evil intentions he shares with his wife. Ernst Wiemann and Calvin Marsh are no better or worse than adequate as King Heinrich and the Herald. The Met came late to stereo broadcasting, so this 1964 performance is monaural. The St. Laurent Studio transfer, as usual from this label, is excellent. The only comparison I have is on Gala, and this new one is considerably more vivid and correctly pitched throughout. Rosenstock observes most of the conventional cuts of the day, including the second verse of 'In fernem Land' and the chorus that follows. The overall timing is some 45-50 minutes shorter than uncut modern studio recordings, including those by Solti, Karajan, and Colin Davis. Any Wagner collection would be incomplete without a representation of Konya's Lohengrin, and this one is at least as good as any of the others and might be preferred because it catches him at the central peak of his career. Another 'plus' is Crespin's sumptuous Elsa. This edition has the best recorded sound of any of the three, though on the other hand the Bayreuth orchestra from this era plays this music at a slightly better level than the Met in its pre-Levine days. St. Laurent Studio, typically for their releases, provides complete track listing and cast and date documentation but no notes or libretto. This release is available from Norbeck, Peters & Ford (www.norpete.com)." "Joseph Rosenstock, who conducted at the Metropolitan Opera and was a general manager of the New York City Opera, also conducted orchestras in Germany and Japan. It was in 1929, at the age of 34, that Mr. Rosenstock first arrived in New York from Germany to be conductor of German opera at the Metropolitan Opera House. Three weeks later he resigned, complaining that the job was affecting his health. When he left the Metropolitan, Mr. Rosenstock went back to Germany, where he became the music director of the Mannheim Opera House. In 1933 he was forced to leave because he was a Jew. He moved to Tokyo in 1936 to take over the Nippon Philharmonic, and remained there until the outbreak of World War II. On Oct. 14, l948, Mr. Rosenstock returned to New York's musical stage. He conducted NOZZE at the New York City Opera, a debut that THE NEW YORK TIMES described as 'masterly'. 'Mr. Rosenstock revealed himself not only as an excellent musician and leader but as a real sensitive artist', Olin Downes, the TIMES critic, wrote in his review. Mr. Rosenstock was 'one who understood the traditions of the opera and the essence of the score', Mr. Downes wrote. 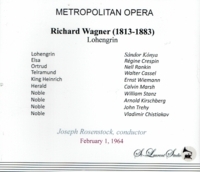 In 1955 Mr. Rosenstock resigned as manager of the City Opera and returned to Japan to conduct. Years later, he told the TIMES critic Donal Henahan that he had left the City Opera because the job 'occupied too much time in administration. I had to check every laundry bill, for example'. Mr. Rosenstock returned to New York and the Metropolitan Opera in 1961 to conduct Wagner's TRISTAN UND ISOLDE, which received accolades from the critics.